The Bible says that the day of the onset of the apocalypse, that is, catastrophe of a planetary scale, is not known to anyone, except God. Nevertheless, are given characteristic features of this time. Extraterrestrial civilizations inform that the apocalypse – is six months , during which mankind has to make the Transition on the Highest level of the other of the material world in the next cycle of life, which will begin there after the general resurrection. The necessity for the Transition is determined by start of global cataclysms of the planet destruction, power of which is incompatible with the life of humanity and organic nature. Before its beginning during one year, will happen three preliminary cataclysms of unprecedented for mankind force. However, humanity has to make the Transition before the second pre-cataclysm, since all the events of this period are associated with the unprecedented loss of the people that could not be enough to start up the mechanism of the Transition. Therefore, immediately after the end of the cycle of Consciousness, i.e. after December 21, 2012 came the eve of the apocalypse, and the apocalypse itself will begin with the first pre-cataclysm. So, 2,000 years ago, when the Bible was created, the date of the apocalypse was not needed. Then mankind had different challenges for improving consciousness on the basis of the commandments. Today, on the eve of the apocalypse humanity needs to know the date and the epicenters of at least the first two pre-cataclysms, in order to make the Transition in time. Consequently, the situation has changed, and humanity from the Above was informed about the time of start of the events. Nostradamus and Edgar Cayce - two great predictors and clairvoyants identified the start time of the beginning of the apocalypse. When the dead will rise from their graves. Let’s consider the decoding of transmitted information by line. Michel Nostradamus was born in France in the family of Sephardic Jews. He was familiar with the Jewish secret teachings of Kabbalah. In accordance with the Jewish calendar October 3, 2016 began a new 5777 year, which will end on September 20, 2018. According to the modern Gregorian calendar on January 1 will come 2017. So, in both calendars in digits of the year will appear digit seven. Thus, from October 3, 2016, when the New 5777 year had started on the Jewish calendar, already goes a preparation for the upcoming events, which will begin with the onset of the new 2017 year. Year 5777 in the digital symbols of consciousness. What means the numbers 5777 in the numeric symbolics of consciousness of extraterrestrial civilizations? As inform extraterrestrial civilizations in the universe are developed five levels of consciousness. The first level – is the level of consciousness of stars. The second level – is the level of consciousness of inorganic nature of the planets. The third level – is the level of consciousness of organic nature – plants and animals. The fourth level – is an individual consciousness of a human being, which includes three previous levels of consciousness. The fifth level – is the united consciousness of humanity. This level is the highest because the united consciousness of people causes an action. Always. This is the Law of Action of the United Consciousness. The Law of Action of the United Consciousness. UNIFICATION OF CONSCIOUSNESS CAUSES AN ACTION. THIS ACTION DOES NOT OBEY LAWS OF THE MATERIAL WORLD, BECAUSE IT IS A RESULT OF THE REARRANGEMENTS OCCURRING IN THE INFORMATION CELL. THE TYPE OF REARRANGEMENTS IS DETERMINED BY THE CHOSEN GOAL. Let’s consider from this point of view, the digits in the number of the year 5777. The number five in the number of the year informs about unification of consciousness of people. The number seven indicates to the seventh planet of the solar system, i.e., on the planet Earth. Four digits of the year mean the fourth level of consciousness - the consciousness of a human. At the same time, three of them - are numbers seven. They mean three previous levels of consciousness included in a human information cell. Thus, the three numbers seven represent people of the Earth. Therefore, the combination of digits 5777 informs that in this year mankind on the planet Earth will unite consciousness. It is known that hecatomb – is a redemptive and the most bloodiest sacrifice of the Ancient Greeks, when a hundred bulls were slaughtered simultaneously in the honor of the formidable goddess, night hunter Hecate, compared with the Moon. Today the word «hecatomb» is a symbol of the bloody events. In a figurative sense hecatomb – is a staggeringly huge number of people – victims of war, terrorism, epidemics, etc., and also natural catastrophes. Thus, the image of hecatomb informs about enormous human losses that will comprehend mankind already at the very beginning of the events of the apocalypse. The selected by Nostradamus image of Hecate transmits also big array of additional information characterizing the period at the beginning of the apocalypse. Hecate was considered the goddess of the Moon, night and underworld, so, it was usually portrayed with a torch in her hand. Underground gods, like Hecate, in ancient mythology personified mainly formidable forces of nature. Thus, Zeus gave her the power over the fate of earth and sea, and Uranus gave indestructible force. All of it informs about the occurrence of the chain of the strongest of natural catastrophes of the apocalypse, connected with land and sea. Snakes in the symbolism of consciousness mean cataclysms. Consequently, two snakes with bent bodies and gaping mouths, depicting a furious aggressive attack, presented near the feet of Hecate in the base of the picture, transmit the following. They warn that the basis of the salvation of mankind from the beginning of cataclysms of incredible power is the principle of the united consciousness of many pairs of people. Connection with the Moon and with the crescent indicates the unification of consciousness as the basis of the Transition. Crescent in the symbolism of consciousness presents a shift of a brain area in individual cell at the unification of consciousness. Full moon presents united consciousness of the Earth civilization, in which the brain area fills the entire cell. The cell of the united consciousness is shown on the pictogram in the form of a large upper circle. The crescent is located underneath. The Torch in the hand of Hecate depicts a laser beam, which has to ignite the united consciousness of civilization for the Transition, connected with a body transformation. The Torch illuminates humanity the only way for prolongation of life. In addition, as it is known, Hecate represents the process, elemental force of destruction for the creation, the power of renewal through death. By this Nostradamus underlines that the only way to prolong life in apocalypse cataclysms - is a body transformation for the Transition to the other level of the material world, where will happen general resurrection. Hecate was considered the patroness of witchcraft and ancestor of the entire enchantress. This emphasizes the magical properties of the action of the united consciousness of civilization, capable to convert bodies of the Earth's people for the Transition on the other level of the material world with other space-time characteristics. The second millennium is named «great» since almost at the very beginning had to occur two greatest events in human life – ending the cycle of Consciousness on December 21, 2012 and the Transition in the cycle of Correction – the next cycle of life – in 2017-2018 years. So, even after the Transition will be less than 20 years from the beginning of the second millennium, i.e. it is really close to the thousandth century. The last line of the quatrain conveys concluding information about the events of the apocalypse. Start of natural cataclysms of incredible strength will force humanity of earth to unite consciousness and to make the Transition in the next cycle of life on the Highest level of the material world. There will happen the general resurrection - when the dead will rise from their graves. So, in terms of predictions of Nostradamus combination of digits in the year 5777 is a pointer to the beginning of the cataclysms of the apocalypse. Nostradamus informs about the beginning of the apocalypse also in the drawings from «The Lost Book». As noted above, the year 2017 corresponds to the condition of Nostradamus in quatrain 47 about the beginning of the apocalypse. According to the Oriental calendar 2017 – is the year of the Red Fire Rooster. Astrologers inform that the dominant influence will render Mars – god of war. Nostradamus has presented the image of the Rooster in «The Lost Book», at least in two pictures «The Wheel of Time» and «The Woman in a tiara with the Rooster on her head». Both pictures show that the Black Rooster depicts the beginning of the time of mortal danger in human life associated with the beginning of the apocalypse. In each picture is presented also the only way of salvation of humanity - the Transition on another the Highest level of the material world into the new cycle of life. So, in the picture «the Wheel of Time», the beak of the excited Black Rooster with raised wings almost touches Hourglass, counting down the last minutes before the start of preliminary cataclysms depicted as the huge green snake that twined round the neck of American Indian. In the picture «the Woman in tiara» the Black Rooster» warns about start of preliminary cataclysms of apocalypse that will interrupt all wars in the world. At the same time, in the interrelations between people will happen an overturn from hate to love and mutual understanding. Cataclysms and the laser beam for the Transition associated with the transformation of a body are shown as the Sun's rays. Detailed decoding of these pictures is presented on our website in articles about «The Lost Book» of Nostradamus. Great American clairvoyant, «sleeping prophet» E. Cayce clarifies information about the beginning of the apocalypse, predicting that the last President of the United States will be the 44-th. As it is known, the inauguration of the next the 45-th President of the United States will take place on January 20, 2017. Casey's prophecy indicates that in the short period before or after the date of inauguration of the 45th US President on January 20 2017 has to occur a natural disaster of incredible power. Moreover, if the prophecy Cayce will come true, the US will be virtually wiped out by the first preliminary cataclysm of September 21, 2017 in the form of tsunami, which will go through the East Coast from the Gulf of Mexico. Moreover, by this time the West Coast already would be destroyed by the strongest earthquake in the fault system «Cascadia San Andreas». So, where will happen the strongest natural catastrophe? The world today is in a critical situation associated with the divergence of tectonic plates manifested in earthquakes, volcanic eruptions and other natural disasters. It seems that the blow may arise in any, the most sudden place on the planet. However, it is not so. According to our understanding of the scenario of future events, the first strongest blow in the circuit of apocalypse cataclysms should occur in Italy and destroy Vatican Сity. About the destruction of Rome before the apocalypse predicted Irish saint Malachy already in the 12th century. In his Prophecies of the Popes, he informed that the last pope will be Peter the Second. This means that Peter the Second, just like the apostle Peter or Peter the First, will be given the two Keys of the kingdom of heaven, but already others. And, indeed, given from the Above the two Keys to the symbolism of consciousness allowed to read the Instructions for the Transition. Thus, the destruction of Vatican means the change the rules and laws that allow to enter the kingdom of heaven and to be saved, but not to perish in the beginning cataclysms. It will be the Transition to the Highest level of the material world in the next cycle of life through the general resurrection. Thus, the destruction of Vatican informs that the time has come to use the Keys of the kingdom of heaven, but it is already others Keys – of the highest consciousness of mankind. And indeed, today Italy is one of the most dangerous places on the planet. On its territory lately often occur strong earthquakes, had activated supervolcano Campi Flegrei. A volcanic area comprised of 24 craters and volcanic edifices along the Italian coast — mostly underwater. The whole system of the volcano today is showing signs of reawakening after a long period of inactivity. 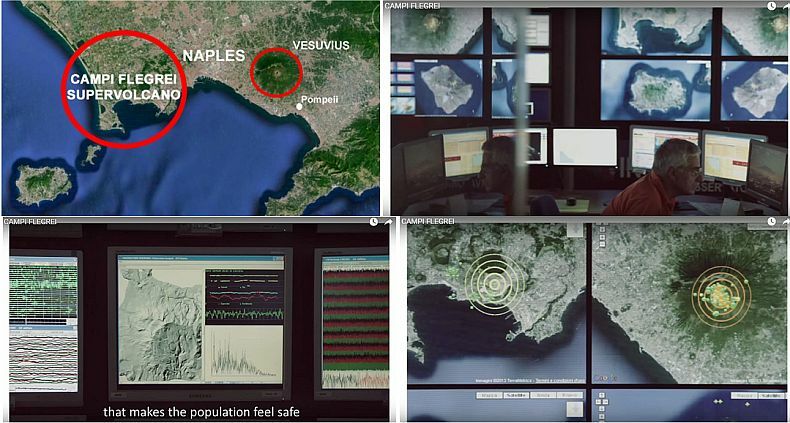 The massive supervolcano is located in the immediate vicinity to Naples – the third largest city in Italy, where live more than 3 million people. The area of the volcano – is 100 sq. km. Volcanologists warn that the gas pressure in the magma is approaching to a critical value, and eruptions of supervolcano occur almost instantaneously. Lava on the Campi Flegrei is very close to the earth's surface. Campi Flegrei is not an ordinary volcano. The eruption of the giant volcano will impact on climate change and completely transform our planet. So, as a result of the volcanic eruption, occurred in the distant past, volcanic winter had come. Ash in the atmosphere blocked the sun's rays, and the temperature on Earth had decreased on 5-10°C. Scientists are concerned that about 15 km from Naples is an active volcano Vesuvius, which is considered to be one of the most dangerous. The eruption of supervolcano can cause activation and the eruption of the Mount Vesuvius. The eruption of Vesuvius on 24 August 79 year is brightly presented in the picture of by Karl Bryullov «The Last Days of Pompeii.» The force of the eruption was so strong that ashes reached even Egypt and Syria. Consequently, there is a coincidence of predictions about the year of the beginning of the strongest cataclysms of the two great the prophets – Nostradamus and E. Cayce. Nostradamus informs that in year 5777 on the Jewish calendar and, respectively, in 2017 will start the games of hecatomb, meaning unprecedented losses of people and E. Casey confirm that the 44th President of the USA is the latest. Thus, 2017 - this is the year. The prediction of Nostradamus about the events of this time in quatrain 47 ends by the words that the dead will raise from their graves. This means that will happen the general resurrection of mankind as the result of the Transition to the new cycle of life. Therefore, if the predictions of Nostradamus and Cayce will come true, the further scenario of the development of the events is already known according to information of extraterrestrial civilizations. In this case, the first pre-cataclysm will happen on September 22, 2017 with the epicenter in the Mexican Golf. The second pre-cataclysm will happen on March 20, 2018. Humanity has to make the Transition in the next cycle of life before the second pre-cataclysm. The date of the first pre-cataclysm is given to mankind in order to verify the reality of the presented scenario. The date of the second pre-cataclysm is given to mankind in order to make the Transition before it begins. After the second pre-cataclysm in the result of huge losses, the united consciousness of humanity already will not be able to start the mechanism of the Transition. Mankind will be destroyed by global cataclysms that will start soon. It will be impossible to hide from disasters anywhere in the world, because they will destroy the planet till its base. To make the Transition one by one will be impossible. Either all civilization simultaneously makes the Transition, or it will be destroyed by the beginning global cataclysms. In his predictions E. Cayce links the blows on the east and west coasts of the United States. He predicted that «When the earth will undergo cataclysmic destruction, the cities of the West Coast of US – San Francisco and Los Angeles – will be destroyed earlier the cities of the East Coast». Thus, neither the East Coast, nor the West Coast of North America, will not escape the tragic fate. Edgar Cayce also claimed that «During strongest natural blow in a few minutes waters of the Mexican Gulf will join with the Great Lakes». Moreover, if the cities of the West Coast will be destroyed by the earthquake, the cities of the East Coast will be destroyed by the tsunami from the Mexican Gulf. It is important to note, that the information of E. Cayce and extraterrestrial civilizations about the epicenter of the first pre-cataclysm in the Gulf of Mexico coincide. 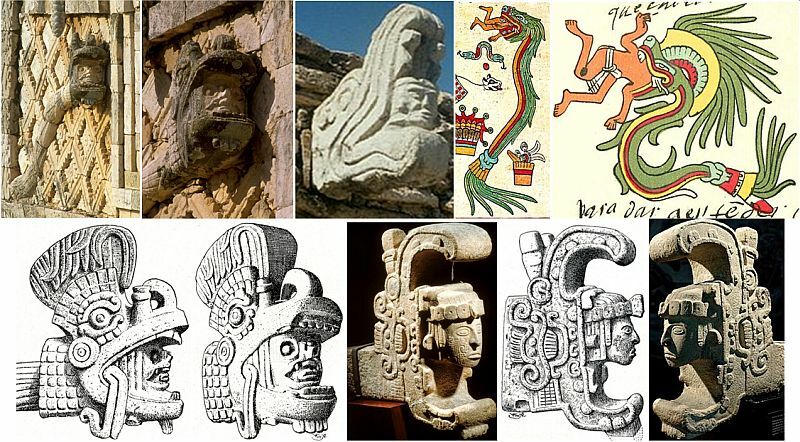 In this place extraterrestrials have built a large number of complexes with the image of the serpents-dragons, from open jaws of which look out heads of people. It shows that cataclysms presented by serpents will swallow whole human beings. Moreover, the blow on the east coast is the first pre-cataclysm. From this date begins the time of the Transition, which ends before the date of the second pre-cataclysm. Consequently, E. Cayce does not link two natural blows on the west and east coasts of America with the end of the term of governing of the 44th President. Therefore, blows on both coasts will be not far away in time from each other. Thus, the natural catastrophe that will occur in a short period before or after the inauguration date is not associated with any of them. Today the west coast of North America is one of the extremely dangerous places on the planet. There are located one after the other two of the most earthquake-prone faults that can cause severe mega-quake that could split the continent, as well as generate a mega-tsunami. It is Cascadia subduction zone (Cascadia fault), and also the San Andreas Fault. These faults located successively, have different types of tectonic processes. Thus, the San Andreas continental transform fault is connected with horizontal shift of plates relatively each other. Other fault – is the linear Cascadia subduction zone (Cascadia fault) - is associated with the immersion of one block of the earth's crust under another. An earthquake on the Cascadia fault would be 30 times more powerful than the San Andreas. Scientists inform, that the Cascadia fault represents much larger threat because it can produce an earthquake of about 30 times more power than San Andreas, with subsequent of tsunami. The San Andreas fault by its movement’ character does not possess such power. The Cascadia fault is capable of producing an earthquake magnitude of more than 9.0. Delay of super earthquake. Scientists warn that a mega-earthquake that can split the continent may start at any moment. Moreover, it already significantly delays. It turns out that the earthquake in the Cascadia subduction zone occured every 240 years. The last earthquake happened in January 26, 1700, and already 315 years it does not occur. So, huge accumulated energy will cause a mega earthquake followed by a mega tsunami. Danger of the location on the Pacific Ring of Fire. The system of the faults «the Cascadia ― San Andreas» are located directly along the Pacific Ring of Fire – the most dangerous region of the planet that had significantly activated in recent years. Such location is associated with the risk of a sudden strengthening of seismic activity of both faults and can cause their chain reaction that is capable to split the continent. A full-scale eruption of the volcano Mount Rainier. The strongest seismic activity of a vast territory can cause full-scale eruption of the volcano Mount Rainier located in Washington State, southeast of Seattle. This volcano is considered the most dangerous volcano in the United States, as it will cause absolutely unprecedented destruction and human losses, scientists inform. Radiation. Nostradamus warned that at the end of the time «common blood will flood the earth, people will live with mouths closed, and unpredictable will come». Unpredictable - it is radiation, unknown at that time phenomenon. And, indeed, as a result of the destruction of nuclear power plants by mega earthquake, accompanied by a mega tsunami, in the world will arise strong radiation. Among the first nuclear power plants, obviously, will be the Diablo Canyon Power Plant, located midway between Los Angeles and San Francisco, just 2 miles from the powerful the Hosgri Fault – component of the system the San Andreas Fault. So, the blow in Italy and earthquakes on the faults Cascadia and San Andreas – it's the beginning of the chain of the strongest natural blows of the first, second and third pre-cataclysms, which will turn into the global cataclysms. They will become more and more stronger, and will continue for millions of years, carrying out the destruction of the planet. According to the predictions of famous W. Messing in 2017 year in the whole world will be no calmness, however, people not have to be afraid of the World War. In 2017 mankind will be transformed and will come to a new stage of evolution. In addition, W. Messing also declared that in 2017 will come a person, who will be the Savior for all. This year will be a period of testings and checks for durability. The world waits for updating of the political and economic structure, and Russia will play one of key roles in this updating. 2017 will become the year of its dawn. The power and the economy will change. Even people will change. And these changes will be directed towards development and prosperity. Nostradamus and E. Cayce predicted, that Russia is predestined a special mission in the world. E. Cayce endowed Russia the great role of the savior of the world and all mankind. He noted that at the onset of severe natural disasters «the hope of the world comes from Russia. It is not communism, but such freedom, when each man will live for his fellow man. The principle has been born there». This way Edgar Cayce described the united consciousness as the basis for Transition to Highest levels of the material world – the only way for the Earth civilization to continue life before the onset of global cataclysms. The knowledge about the Transition mankind will receive from Russia. And, really, the technique of Transition given by extraterrestrial civilizations is in detail stated in the Instructions written by symbolics of consciousness. To us, two Russian scientists, the authors of this article, from the Above were given the two keys which have allowed to decode these Instructions for the Transition. Nobody imagine, how deep will be the changes. Mankind will become unified with one heart and one soul. Russia will be the foundation for regeneration of the whole world.